This paper takes as its starting point two drawings by David Musgrave in Tate’s collection, Plane with inverted figure 2007 and Folded plane no.2 2009. It examines Musgrave’s motivation for employing traditional drawing techniques and investigates what the medium of drawing can offer an artist today. Plane with inverted figure 2007 (fig.1) shows an upside-down stick figure scored into card. Stick figures are typically used as a sign, a shorthand version of the real thing. This one, however, appears to have been carefully drawn, its legs neatly touching a horizontal line. The precision of the drawing undermines the casualness or brevity denoted by its character as a stick figure. If the work were untitled, would we see this figure? I think the answer is yes, because of our capacity to anthropomorphise the most basic lines and shapes. 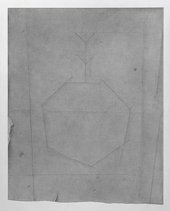 The lines that describe the figure do not sit on a blank, white sheet of paper: they appear incised rather than drawn, and the ground possesses a significant materiality, suggestive of stone rather than paper. This is because Musgrave’s maquette was made on greyboard, which has a soft, impressionable surface. Through careful use of graphite on paper he has rendered trompe l’œil pockmarks, tears and scuffs, creating an image of a distressed surface. Folded plane no. 2 (fig.2) depicts a piece of paper that has been scored, folded, then crumpled, opened up again and smoothed out. The sparse, precise, geometrical lines of Plane with inverted figure have given way to multiple scribbled lines. And yet a ‘figure’, or at least a large circle, two smaller circles and an ellipse suggestive of a face can be deciphered, even if the torso and limbs are all but lost in the carefully depicted crumples. 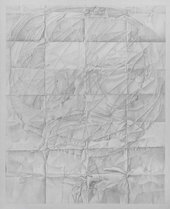 While the image is clearly hand-drawn, the hard graphite and use of blank paper work together to create an illusion of the folds and creases of the paper. The image is simple but also puzzling. Is it to be read as an invention of the artist’s or a copy of something pre-existing, a found piece of paper? 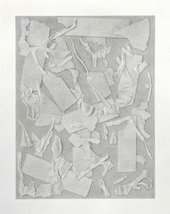 Other works in the series, which so far consists of around twenty drawings, are created through a combination of processes and it is this combination that distinguishes the series and Musgrave’s particular approach to making drawings. Musgrave does not begin with a particular image in mind that he duly executes using mimetic procedures. He begins by making a maquette or identifying a suitable object. This forms the starting point of the final drawing and a certain amount of its production involves careful observation and copying. However, it is the image unfolding on the paper that is of importance and improvisation and a combining of sources are employed to ensure its integrity. The first of Musgrave’s Plane drawings, Plane 2005–6 (fig.3) shows a surface encrusted with the sort of detritus that might cover an artist’s studio, table, floor or wall – squiggles of paint, bits of tape, splashes of liquid, evenly distributed. Over this textured surface is drawn a stick figure whose large head touches the top and sides of the image and whose legs finish at the bottom. Trompe l’œil pieces of tape appear to hold the image down. This drawing typifies the series, as it combines reproduction and invention and is not a straight copy of a maquette or found object. 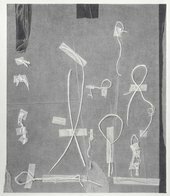 The title of Plane with paper scraps 2006 (fig.4) suggests that there is no figure to be found in the image, but the scraps form a circle in the upper half of the drawing and a vertical strip can be read as a torso. The fragments suggest the scattered bones of some creature, the care with which they have been torn and placed upon the plane somehow investing the arrangement with order and life. As the descriptions of Musgrave’s sculptures and wall paintings make clear, his practice is not only devoted to drawing. This paper, however, considers why Musgrave chooses drawing as a means to produce his finished works. To answer this question we need to remind ourselves of the enquiry that underlines all of Musgrave’s artistic activity: how can a work of art address its material condition and simultaneously conjure an imaginary world or being? Musgrave’s interest in unravelling the pretence of objective truth is one, of course, that he shares with many of his contemporaries. He emerged as an artist at a time when the American Robert Gober (born 1954) and the German Martin Honert (born 1953), were using artisanal methods and mimetic procedures to create work, primarily in three dimensions, that imitated everyday objects. Other artists who had a significant influence on Musgrave were LA-based artists Vija Celmins (born 1938) and Ed Ruscha (born 1937), both of whom pressed drawing into the service of mimesis in the early 1970s. A return to figuration and the employment of more traditional, sometimes labour-intensive techniques allowed artists of Musgrave’s generation to rediscover drawing as a valid medium for making finished works. In 1969 the American conceptual artist Mel Bochner wrote an essay titled ‘Anyone Can Learn to Draw’. In this short text he attempted to unravel drawing’s then questionable status. He identified three principal modes of drawing: working, diagrammatic and finished. For Bochner, the first, as the ‘residue of thought’, was the most important, with finished drawings the least: ‘finished drawings don’t really have to be talked about in terms of drawing at all, but rather must be related back to the artist’s practice as a whole.’14 In other words, a finished drawing was equated with craft and manual dexterity, the importance of which conceptual artists of the 1960s were bent on undermining. 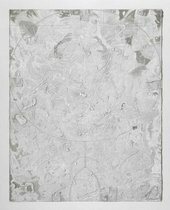 Significantly, however, the techniques and rules of ‘finished drawing’ have been embraced by a number of artists since the early 1990s, as marked by the Museum of Modern Art’s exhibition of 2002, Drawing Now: Eight Propositions. This exhibition included the work of twenty-six artists whose drawing practice is related to that of nineteenth century predecessors who favoured the polished, finished article over the working document. MoMA’s drawing survey exhibitions, the first of which took place in 1976, attempt to identify predominant tendencies in drawing. The work selected for the 2002 exhibition was described as ‘projective’ drawing, that is, depicting something that had been imagined before it was drawn. The MoMA exhibition followed a very particular trajectory in contemporary drawing, one that develops drawing’s long-established link to figuration and narration and places it at the service of an exploration of everyday life rather than the language of fine art. It could be argued that Musgrave’s practice constitutes an exploration of the latter and that his finished drawings relish the containment that such finish might offer. His imagery resembles archaeological fragments or graffiti incised into stone, and his work can be seen as lying at an intriguing junction between those artists who use ‘finished’ drawing for descriptive and narrative purposes, as typified by the MoMA exhibition, and those who use ‘unfinished’ forms to explore political issues and abject states of mind, such as Los Angeles-based artists Paul McCarthy and Mike Kelley. Art historian Benjamin Buchloh has suggested that the history of drawing from the early twentieth century divides into two categories – matrix and grapheme. He uses the work of Jasper Johns to illustrate the model of drawing as matrix (‘Johns … denied the gestural trace any privileged access to function as an index of subjective experience’) and Cy Twombly the model as grapheme (‘[Twombly] precisely foregrounded the pure indexicality of the grapheme as subjective inscription in order to reveal to what extent the formation of subjectivity originated in the commonality of neuro-motoric and psychosexual impulses.’)15 For Buchloh the matrix model delivers an abstract form of the object, and the grapheme performs an abstract version of the subject. Between these two forms lies the palimpsest, essentially a flat ground scarred by erasure. It inhabits neither the world of the object nor that of subject but instead a ground whose scars suggest the passage of time. What position would Musgrave’s Plane drawings occupy within Buchloh’s tripartite division of drawing modes? His Plane drawings present themselves as palimpsests, whose age-old surfaces are scarred by creases, scuffs, and tears wrought by supposedly intuitive acts such as scribbling, doodling, crumpling and folding. Yet the expressive scribbled lines of Folded plane no.2 also seem to incorporate the gestural mode of the grapheme. The viewer needs to pass through a number of cognitive stages to realise that a matrix mode of drawing has been used to create this artifice. Musgrave manages to invest a very shallow picture plane with an image of material density while avoiding the pitfalls of expressive inflection. Musgrave adopts an objective stance in relation to his methods of production; yet the subject matter is subjective, wrestling as it does with quite idiosyncratic preoccupations. It could be argued that while enacting a self-referential and analytical dialogue with the rules of traditional art forms, and particularly those associated with drawing, Musgrave’s ‘faulty images’ still perform an inter-subjective role. 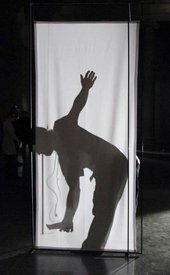 His interest is in enacting a cognitively satisfying dialogue with his viewers rather than serving up emotive gestures. 1. David Musgrave, email to the author, 8 June 2010. 3. Musgrave, quoted in Recognition, exhibition catalogue, Arnolfini, Bristol 2003, p.17. 4. Musgrave, quoted in In Between the Lines. Recent British Drawing, exhibition catalogue, Trinity Contemporary, London 2009, p.97. 5. Musgrave, quoted in Arnolfini 2003, p.22. 6. Martin Herbert, ‘Transformer’, Frieze, no.77, September 2003 (http://www.frieze.com/issue/article/transformer/ accessed 24 March 2011). 7. Musgrave, conversation with the author, July 2010. 10. ‘Living Dust’, Norwich Gallery, Norwich School of Art and Design, September–October 2004. 11. David Musgrave, Living Dust, exhibition catalogue, Norwich Gallery 2004, p.11. 13. Musgrave, quoted in Arnolfini 2003, p.21. 14. Mel Bochner, ‘Anyone Can Learn to Draw’ (1969), Solar System and Rest Rooms: Writings and Interviews, 1966–2007, Cambridge MA and London 2008, p.61. 15. Benjamin Buchloh, ‘Raymond Pettibon: Return to Disorder and Disfiguration’, October, vol.92, Spring 2000, p.46. 17. Musgrave, email to the author, May 2010. Kate Macfarlane is Co-Director of the Drawing Room, London. Kate Macfarlane, ‘David Musgrave: Faulty Images’, in Tate Papers, no.15, Spring 2011, https://www.tate.org.uk/research/publications/tate-papers/15/david-musgrave-faulty-images, accessed 22 April 2019.